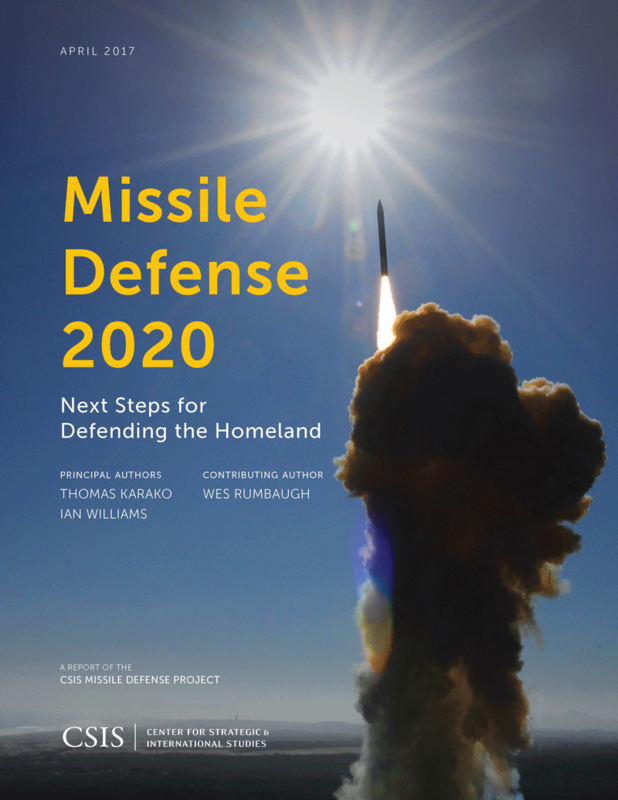 Note: This appears as Chapter 1 in Missile Defense 2020: Next Steps for Defending the Homeland. Missile defenses for the homeland now represent an established part of U.S. national security strategy and policy, and the first priority of U.S. missile defense efforts, even while the particular programs, budget levels, and metrics of sufficiency have varied over time. Sometimes long-range missile threats to the homeland have been assessed as more urgent; at other times, regional missile defenses have received more emphasis. Global proliferation trends reflect a range of threats increasing in complexity, number, and capabilities, with missiles becoming more accurate, mobile, prompt, and survivable. Besides purely ballistic threats, new adversary capabilities now include a range of cruise missiles and maneuvering boost-glide vehicles. Should these missile trends continue, the demand for ways to defend against and defeat them will also continue to rise. Throughout the long history of efforts to protect against missile attack, active missile defense has never truly been a substitute or replacement for offensive retaliatory capabilities within the overall U.S. strategic posture. Some forms of passive defense against missiles have also never been controversial, such as hardening ICBM silos and putting missiles undersea and aircraft on alert. In terms of active defenses, there has been considerable variation between the objects of defense, the identity of the adversaries against whom defenses were directed, and the thickness or thinness of the defense pursued. Recent U.S. policy does not seek missile defenses to safeguard the American homeland against either large- or small-scale missile attacks by Russia or China, preferring to rely on offensive-based deterrence to address these threats. The focus of U.S. missile defense has instead been to counter the limited and emerging ICBM threats from rogue states such as North Korea and Iran. This policy reflects two factors: the desire to not disrupt “strategic stability” with Russia or China, and the costs and technical limitations of such a system. This basic posture is evidenced in the characteristics, capacity, and capabilities of GMD. These general expectations for homeland missile defense reflect significant continuity across at least the past two administrations, as indicated by high-level expressions of U.S. policy and strategy.2 In 2008, Secretary of State Condoleezza Rice remarked, “It is true that the United States once had a Strategic Defense Initiative, a program that was intended to deal with the question of the Russian strategic nuclear threat. This is not that program. This is not the son of that program. This is not the grandson of that program.”3 Undersecretary of State Rose Gottemoeller made a similar point in a November 2014 speech in Bucharest. Addressing the perennial Russian and Chinese complaints about U.S. missile defenses as destabilizing, Gottemoeller noted that “our limited numbers of defensive systems cannot even come close to upsetting the strategic balance.”4 As she pointed out, even the plan for 44 homeland defense interceptors is 24 fewer than the 68 interceptors deployed around Moscow, but of course the United States is not concerned about the impact of those 68 on strategic stability. Of course, this general posture of pursuing “limited” national missile defense could well change. A future administration could conceivably decide that long-range missile defense was too difficult or costly at the margin and choose to accept vulnerability, even with states like North Korea, and rely exclusively on offensive means of deterrence.9 Such a choice would represent a significant discontinuity from the past. The Clinton administration began the NMD program in part based on the increasing realization that relying on purely offensive deterrence with North Korea simply did not seem to make sense. As President Clinton himself later put it, “You can’t be an internationalist if you allow yourself to be blackmailed.”10 Such an offensive deterrence-only relationship with North Korea seems unlikely. with funding subject to the annual authorization of appropriations and the annual appropriation of funds for National Missile Defense. with funding subject to the annual authorization of appropriations and the annual appropriation of funds for National Missile Defense. U.S. missile defense policy and posture are predicated on the principle that the United States homeland cannot be held hostage by a country such as North Korea. As Admiral Gortney remarked in April 2016, “We are concerned the possession of a nuclear ICBM could embolden the [North Korean] regime’s intransigence below the nuclear threshold and complicate our response to a crisis on the peninsula.”11 As such, a limited long-range missile defense serves the strategic purpose of giving “the United States . . . the freedom to employ whatever means it chooses to respond to aggression without risk of enemy escalation to homeland strikes.”12 This freedom of action supports allied confidence that the United States will live up to its alliance commitments, lowering the risk of alliance decoupling. Assurance of allies in turn strengthens extended deterrence, helps promote regional stability, and fosters an environment more favorable to nonproliferation. The goals of homeland missile defense might alternatively be revised upward, to include protection against not only attacks from North Korea and Iran, but to provide a thin defense against certain kinds of limited missile attack from Russia or China. Such a defense could include either protection for U.S. population centers or for nuclear and other strategic forces so as to enhance rather than undermine strategic stability. The objectives of homeland defense might also be expanded to include nonballistic missiles. Hypersonic boost-glide vehicles have recently begun to get more research and development attention, but there remains virtually no significant capability to defend against cruise missile attack on the National Capital Region. The National Defense Authorization Act passed in late 2016 revises the 1999 formulation (Table 1.1), declaring that U.S. policy is to “maintain and improve an effective, robust layered missile defense system capable of defending the territory of the United States, allies, deployed forces, and capabilities against the developing and increasingly complex ballistic missile threat.”13 The conference report further added that “nothing in this legislative provision requires or directs the development of missile defenses against any country or its strategic nuclear forces.”14 For the time being, much more remains to be done simply to keep pace with the existing threat set. Homeland missile defense can also improve crisis stability by offering the United States an option other than preemption or retaliation. This is especially true when dealing with smaller “rogue” states against which the United States might take preemptive military action during a crisis. In the lead-up to North Korea’s Taepodong-2 launch in 2006, GMD may have lessened the pressure on President Bush to preemptively strike North Korea’s launch facilities, a course of action advocated at the time by former secretary of defense William Perry and then former assistant secretary of defense Ashton Carter.15 Such a posture buys time and creates options for decisionmakers, which in turn supports stability. Homeland missile defense also serves the purpose of raising the threshold for aggression for an adversary wishing to undertake military action against the United States. Having the ability to defend against a certain number of long-range missiles requires an adversary to employ a greater number of missiles to achieve the same objective, thus making a “cheap shot” against the American homeland or military forces more difficult. Forcing an adversary to thus increase the size of an attack increases the likelihood that preparations for such an attack will be detected in advance, creating opportunities for the United States to either de-escalate the crisis or take preemptive strikes. The fielding of a limited yet effective long-range missile defense system could contribute to a secondary deterrence-by-denial effect, whereby emerging regional challengers are dissuaded from investing in long-range ballistic missile technology. Without insight on the inner working of Iranian or North Korean strategy and U.S. resource allocation deliberations, however, this potential effect remains difficult to assess. Missile defenses have come a long way, but have thus far not dissuaded proliferators that missiles are impotent or obsolete. Looking ahead, the United States and its allies and partners may expect to encounter more multifaceted threats that could overcome current defense systems, including advanced cyber intrusions, electronic warfare, directed energy, and hypersonics. MDA has been assigned responsibility for the hypersonic mission, but not the funds to do much about it. Future decisionmakers will have to consider whether MDA should retain its near-exclusive focus on material development for the ballistic missile defense mission or expand its mandate to address the broader suite of cruise missile, air defense, and hypersonic threats. As of today, Iran and North Korea have not yet, strictly speaking, demonstrated an ICBM with a flight test. Nevertheless, both have extensive missile development programs, have deployed a significant number of medium- and intermediate-range missiles, and put satellites into orbit, all major steps critical to ICBM development. Much attention has been given to whether Iran or North Korea could acquire an ICBM by the year 2015. For at least 15 years, intelligence reports and testimony continued to peg threat assessments to the 2015 time frame. Now that 2015 has come and gone, some observers have questioned the validity of previous U.S. assessments on rogue state ICBM development.23 It could well be, however, that actions taken on the basis of those intelligence assessments may have had some effect on preventing the past potentialities from being actualized. The United States and others have not stood idly by with missile developments by Iran, North Korea, and others. They have rather engaged in a systematic range of counterproliferation and nonproliferation efforts, ranging from diplomacy and sanctions to interdiction and, reportedly, various forms of sabotage. Relying on indefinite counterproliferation success in the absence of active defenses, however, also carries considerable risk. North Korea also possesses a Satellite Launch Vehicle (SLV), the Unha-3, which was used to successfully orbit a small satellite in December 2012 and January 2016, thus indicating North Korea’s capabilities for a number of long-range missile technologies. The heads of U.S. Forces Korea (USFK) and of NORTHCOM have both suggested that North Korea has the capability to miniaturize a nuclear weapon for the KN-08.31 In March 2016, images released by the Korean Central News Agency (KCNA) featured North Korean leader Kim Jong-un inspecting what appears to be a miniaturized nuclear device.32 The validity of these photographs has not been verified, however, and North Korea has been known to use mock-ups in state propaganda in the past. Images released of ground tests on the reentry vehicle heat shield, and of more advanced missile engine tests, are made to leave the impression that North Korea is progressing in its long-range ballistic missile capabilities and is not deterred or slowed by international sanctions. Iran has also used its long-range rockets to put satellites into orbit, with its fourth launch occurring in February 2015. Over the past decade, Iran has conducted numerous tests of the two-stage Safir SLV and has been developing a larger two-stage SLV dubbed the Simorgh, which Iran reportedly tested in April 2016 with unclear results.36 Many of the technologies developed for these SLV programs could be applied to creating an ICBM.37 Where SLV and ICBM technologies differ, however, is the ICBM’s need for a reentry vehicle capable of reentering the atmosphere and detonating a nuclear device.38 Iran has not yet demonstrated these capabilities. Both Russia and China have formidable strategic assets. Russia possesses over 300 ICBMs equipped with multiple independent reentry vehicles (MIRVs), as well as over 175 SLBMs deployed across 11 submarines, all capable of delivering nuclear payloads to the United States.41 Russian missiles are furthermore described as having been designed to defeat U.S. missile defenses, including with decoys and other sophisticated countermeasures and penetration aids. China, for its part, deploys more than 60 ICBMs holding the continental United States at risk, and it is currently developing a modern fleet of nuclear ballistic missile submarines equipped with nuclear-tipped SLBMs with a reported range of over 7,000 km. The magnitude of the threat from these near-peer actors makes building a robust missile defense against them a significant challenge. It seems unlikely that the United States would attempt in the near term to shift toward a defense dominant posture with respect to Russian and Chinese long-range missile forces, but homeland missile defense need not forswear attention to these threats entirely. In the past, the United States has pursued thin or point defenses to support deterrence and enhance strategic stability with Russia or China, such as with Sentinel, Safeguard, and LoAD (see Chapter 2). Given the past decade’s developments in the demonstrated hypersonic and cruise missile capabilities of Russia and China, missile defenses of various kinds could support the survivability of U.S. nuclear forces. The dynamic between strategic forces and active missile defense could perhaps figure in the next U.S. nuclear posture review. Russia moreover openly markets for export highly portable cruise missiles that could be used to threaten the United States homeland. The Klub-K missile is derived from the SS-N-27 Sizzler, whose shorter range falls within arms control export regimes. It can also fit inside a cargo container, making it easy to transport and potentially launch from a ship or undersea platform of some kind.45 In addition to the element of surprise these systems could bring, they also provide mobility and could be fired from locations such as the Gulf of Mexico or elsewhere to evade some U.S. early warning sensors. The ballistic and cruise missile threats to the United States and its allies are not diminishing. In the coming years, North Korea could well enter into serial production of intercontinental ballistic missiles. Iran has also shown no sign of abandoning its long-range efforts. It would be quite difficult and costly to face a situation of significantly greater threats in, say, 2025, and attempt to catch-up. Outpacing rather than chasing these threats will require increased effort. 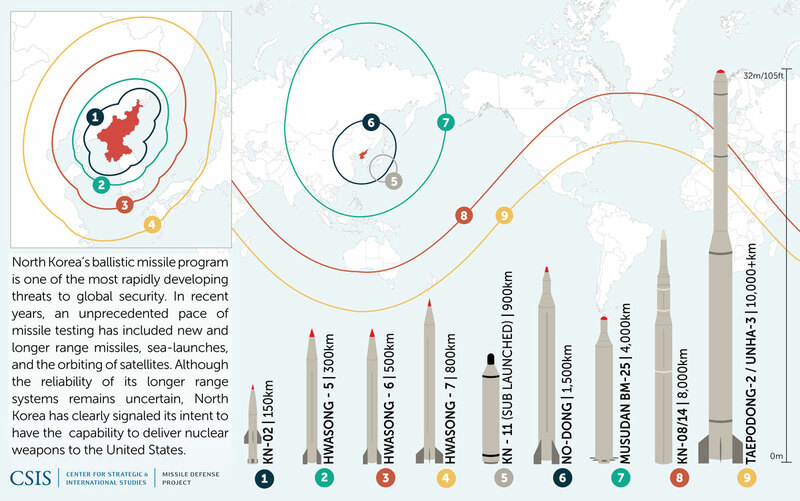 Missile Defense Project, "Homeland Missile Defense in U.S. Strategy," Missile Threat, Center for Strategic and International Studies, April 7, 2017, last modified June 15, 2018, https://missilethreat.csis.org/homeland-missile-defense-u-s-strategy/. Ronald Reagan, “Address to the Nation on Defense and National Security” (speech, Washington, DC, March 23, 1983). See, for example, U.S. Department of Defense, Nuclear Posture Review (Washington, DC: Department of Defense, 2001); George Bush, National Security Strategy of the United States (Washington, DC: The White House, 2002); George Bush, National Strategy to Combat Weapons of Mass Destruction (Washington, DC: The White House, 2002); George Bush, National Policy on Ballistic Missile Defense (Washington, DC: The White House, National Security Presidential Directive-23, 2002); Department of Defense, Ballistic Missile Defense Review Report (Washington, DC: Department of Defense, 2010); Department of Defense, Nuclear Posture Review Report (Washington, DC: Department of Defense, 2010); Martin E. Dempsey, Joint Integrated Air and Missile Defense: Vision 2020 (Washington, DC: Joint Chiefs of Staff, 2013); Department of Defense, Quadrennial Defense Review (Washington, DC: Department of Defense, 2014); Department of Defense, Strategy for Countering Weapons of Mass Destruction (Washington, DC: Department of Defense, 2014); Barack Obama, National Security Strategy of the United States (Washington, DC: The White House, 2015). Condoleezza Rice, “Remarks with Polish Foreign Minister Radoslaw Sikorski after Their Meeting” (news briefing, Benjamin Franklin Room, U.S. Department of State, Washington, DC, February 1, 2008). Rose Gottemoeller, “America’s Commitment to Ballistic Missile Defense and the European Phased Adaptive Approach” (speech, Bucharest, Romania, November 18, 2014). James A. Winnefeld Jr., “Missile Defense and U.S. National Security” (speech, Center for Strategic and International Studies, Washington, DC, May 19, 2015). Department of Defense, Ballistic Missile Defense Review Report, 13. Emphasis added. Bush, National Policy on Ballistic Missile Defense, 2. William E. Gortney, “USNORTHCOM and NORAD Posture Statement” (statement before the House of Representatives Armed Services Committee, Strategic Forces Subcommittee, April 14, 2016). Brad Roberts, “Nowhere to Go but Up? U.S.-Russia Relations and the Threat of Nuclear War” (speech at Middlebury Institute of International Studies at Monterey, CA, May 3, 2016); Brad Roberts, “Anticipating the 2017 U.S. Ballistic Missile Defense Review” (remarks at the Royal United Services Institute’s Missile Defense Conference, London, UK, April 13, 2016). Bradley Graham, Hit to Kill: The New Battle over Shielding America from Missile Attack (New York: Public Affairs, 2003): 96–99, 379. Brad Roberts, “On the Strategic Value of Ballistic Missile Defense,” Institut Français des Relations Internationales Proliferation Papers 50 (June 2014): 24. National Missile Defense Act of 1999, Pub. L. No. 106-38, 113 Stat. 205 (1999). National Defense Authorization Act for Fiscal Year 2017, Conference Report to Accompany S.2943, Sec.1694, 114th Congress (2016): 1598. National Defense Authorization Act for Fiscal Year 2017, Conference Report to Accompany S.2943, Sec.1694, 114th Congress (2016): 2687. Ashton B. Carter and William J. Perry, “If Necessary, Strike and Destroy,” Washington Post, June 22, 2006, http:// www.washingtonpost.com/wp-dyn/content/article/2006/06/21/AR2006062101518.html. “USS Mason Launches Three Interceptors to Defend against Yemen Cruise Missile Attack,” Missile Threat, Center for Strategic and International Studies, October 13, 2016, https://missilethreat.csis.org/uss-mason-launches-three-interceptors-defend-yemen-cruise-missile-attack/. Lieutenant General David L. Mann, “Ballistic Missile Defense Policies and Programs” (statement before the Senate Armed Services Committee, Strategic Forces Subcommittee, April 13, 2016). Jonathan W. Greenert and Raymond T. Odierno, “Adjusting the Ballistic Missile Defense Strategy,” DoD Memorandum, November 5, 2014. Thomas Karako, Wes Rumbaugh, and Ian Williams, The Missile Defense Agency and the Color of Money: Fewer Resources, More Responsibility, and a Growing Budget Squeeze (Washington, DC: Center for Strategic and International Studies, 2016), 4, https://www.csis.org/analysis/missile-defense-agency-and-color-money. Ashton Carter, “Remarks at National Press Club” (speech, National Press Club, Washington, DC, May 7, 2013). Andrea Shalal, “Pentagon Plans Work on New Missile Defense Interceptor,” Reuters, February 25, 2014, http://www.reuters.com/article/us-usa-budget-missile-idUSBREA1P03F20140226. Kenneth Todorov, “Consolidating Our Gains, Looking to the Future” (speech, Air Force Association, Reserve Officers Association and National Defense Industrial Association Capitol Hill Forum, Washington, DC, June 18, 2015); Senator Jeff Sessions, “Ballistic Missile Defense Policies and Programs” (statement during the hearing before the Senate Armed Services Committee, Strategic Forces Subcommittee, April 13, 2016). 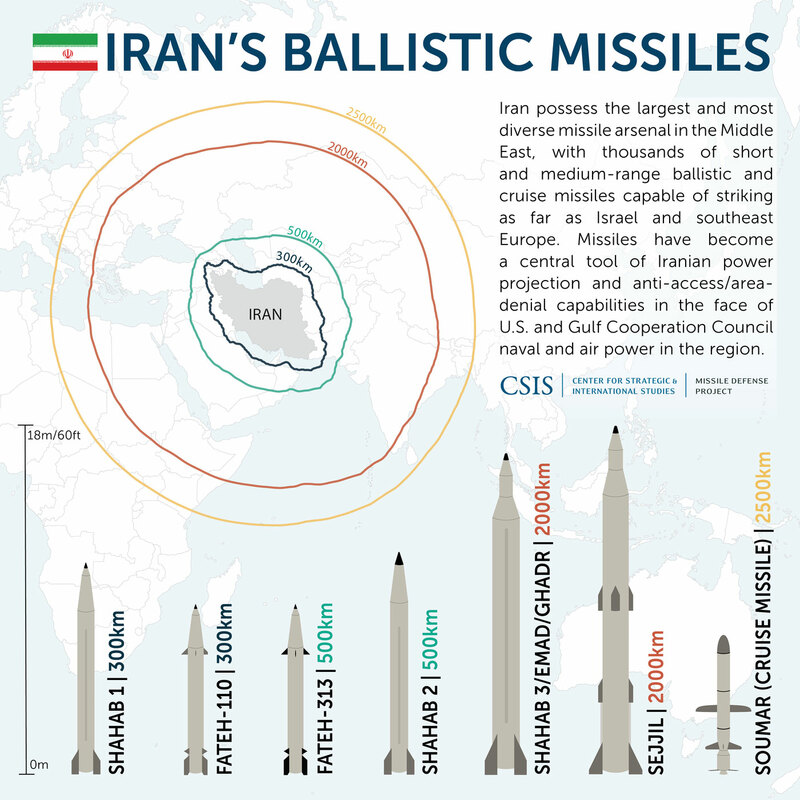 Greg Thielmann, “Updated: Iran’s Overdue ICBM,” Arms Control Now (blog), Arms Control Association, February 2, 2015, https://www.armscontrol.org/blog/ArmsControlNow/2015-01-26/Irans-Overdue-ICBM. DoD, Ballistic Missile Defense Review Report, 11. Steven Lambakis, The Future of Homeland Missile Defenses (Fairfax, VA: National Institute Press, 2014), 2. Elaine Bunn, “U.S. Missile Defense Policy” (speech, 2014 Space and Missile Defense Symposium, Huntsville, AL, August 13, 2014). 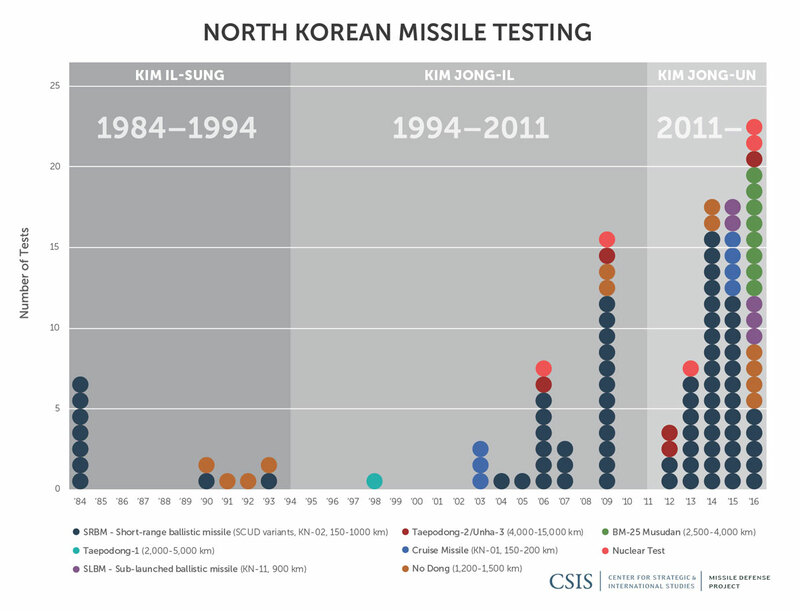 “Ballistic Missiles of North Korea,” Missile Threat, Center for Strategic and International Studies, accessed November 13, 2016, http://missilethreat.csis.org/north-korea/. John Schilling, “A Partial Success for the Musudan,” 38 North, June 23, 2016, http://38north.org/2016/06/jschilling062316/. John Schilling, “Where’s That North Korean ICBM Everyone Was Talking About?,” 38 North, March 12, 2015, http://38north.org/2015/03/jschilling031215/; Richard D. Fisher Jr., “North Korea Unveils New Version of KN-08 ICBM,” IHS Jane’s 360, October 13, 2015, http://www.janes.com/article/55190/north-korea-unveils-new-version-of-kn-08-icbm. “North Korea Submarine Fires Ballistic Missile,” BBC, August 24, 2016, http://www.bbc.com/news/world-asia-37171608. Richard Sisk, “U.S. General Tells Senate North Korea Can Hit U.S. with Nuclear ICBM,” Military.com, April 16, 2015, http://www.military.com/daily-news/2015/04/16/us-general-tells-senate-north-korea-can-hit-us-with-nuclear-icbm.html; William E. Gortney, “Department of Defense Press Briefing by Admiral Gortney in the Pentagon Briefing Room” (news briefing, Washington, DC, April 7, 2015). “North Korea ‘Has Miniature Nuclear Warhead,’ Says Kim Jong-un,” BBC, March 9, 2016, http://www.bbc.com/news/world-asia-35760797. National Air and Space Intelligence Center (NASIC), Ballistic and Cruise Missile Threat (Wright-Patterson Air Force Base, OH: NASIC Public Affairs Office, 2013), 10–28; “Ballistic Missiles of Iran,” Missile Threat, Center for Strategic and International Studies, accessed November 29, http://missilethreat.csis.org/iran/. John Chipman et al., Missile-Defence Cooperation in the Gulf (London: International Institute for Strategic Studies, 2016), 30–31. Kelsey Davenport, Daryl G. Kimball, and Greg Thielmann, Solving the Iranian Nuclear Puzzle: The Joint Comprehensive Plan of Action (Washington, DC: Arms Control Association, 2015), 27. Tamir Eshel, “Simorgh First Launch—An Iranian Success or Failure?,” Defense Update, April 24, 2016, http://defense-update.com/20160424_simorgh.html. NASIC, Ballistic and Cruise Missile Threat, 19. Bob Walpole, “Foreign Missile Developments and the Ballistic Missile Threat to the United States through 2015,” National Intelligence Council, September 1999. Emad has a reported accuracy of within 500 meters, in contrast to the Shahab-3, reportedly only accurate to within 2,500 meters. James C. O’Halloran, ed., IHS Jane’s Weapons: Strategic 2015–2016 (United Kingdom: IHS, 2015), 48. Lieutenant General Michael T. Flynn, “Current and Future Worldwide Threats” (statement before the Senate Armed Services Committee, February 11, 2013). Hans M. Kristensen and Robert S. Norris, “Russian Nuclear Forces, 2016,” Bulletin of the Atomic Scientists 72, no. 3 (2016): 125–134. NASIC, Ballistic and Cruise Missile Threat, 26. Gortney, “USNORTHCOM and NORAD Posture Statement,” April 14, 2016. Igor Sutyagin, “Advances in Missile Delivery Systems” (remarks at the EU Non-Proliferation and Disarmament Conference 2015, Special Session 8, Brussels, Belgium, November 11, 2015).